As most of you have guessed we are doing a reset of the server. This is a hard reset, some things will change others will stay the same. In this post we want to highlight a few things to hopefully answer your questions. We are aiming to have the new server rolled out next week! Though the 15th is not promised (you never know what issues we may run into) we will have it out by easter! Please understand that we are not going to release information about all changes (even when asked). 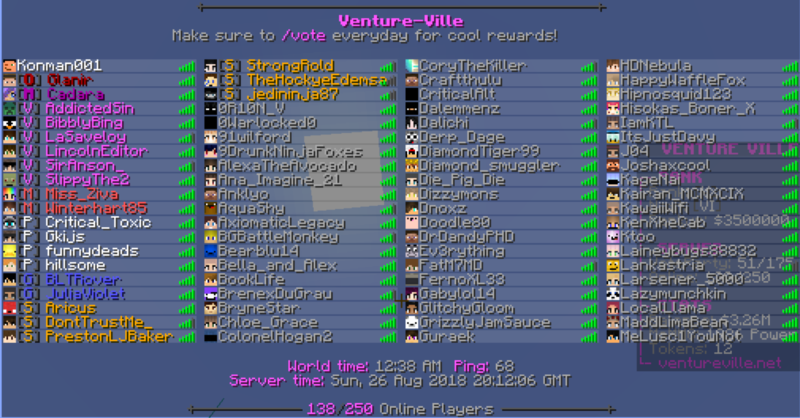 Hey guys, so I know most of you have probably seen me around the discord and maybe even the server, handing most of the operations of Venture-Ville recently. Sirkillian wanted Venture-Ville to get the treatment it needed so he decided to bring in a helping hand (me) to sort of run things around here while he is busy on other projects. I want to give you a brief background of who I am so you can have faith that I know what I am doing. As you might have noticed, Conrad stepped down from his ownership position today. I was given the opportunity to take over and make sure the server will still be maintained and therefore, not close down. Now, you might be wondering, "who is this dude?" and well, let me introduce myself. My name is Killian (big surprise ikr...) and I'm 23 years old living in Belgium. I've been involved with maintaining/running Minecraft servers for many years now and I guess you could say my specialty is Survival Minecraft. I believe I'm well taught about how all of this works and I strongly believe that I'll have no problems adjusting myself to make sure your favorite server will get back to its prime. I'm happy to be able to continue what was created and I'll do my very best to make sure everyone is happy with this change. I plan on fixing existing bugs and adding new content overtime. However, I'm not going to make major changes for the first few weeks because I don't think that would be the right thing to do. I'll be focusing on getting to know the community first. As of right now Conrad will still be on-board to help with the transition and making sure everything will go flawless. PLEASE ALSO NOTE THAT THE WEBSITE IS BEING REVAMPED SO PLEASE EXCUSE SOME FORMATING OR COLORING ISSUES. The poll results now show what we will be doing with the future of Venture-Ville. From this announcement, we will now be doing a FULL RESET. Now you're probably thinking "woaaaahhh MY BUILDS", I wouldn't panic too much as we will having the current world up for showcase. This means you will be able to warp to this world but not be able to interact with it. (Build, break, open stuff etc.) We will also be putting this world up for download in time.